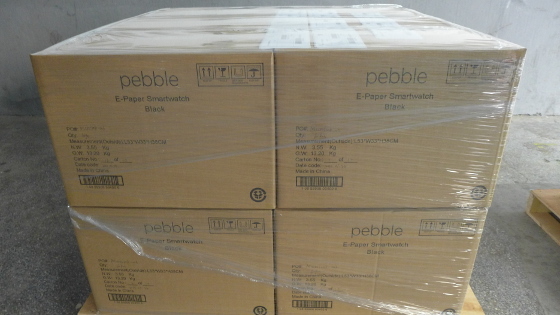 Pebble will start shipping today! We'll be sending out the first batch to the very first backers this afternoon. There are still some kinks and issues that we need to work out, but I'm glad to say we've made it this far. Pebble iOS App is not yet available in the App Store. We submitted 2 weeks ago and have been responding to reviewer feedback. For the moment, iOS users who receive Pebble early will be able to do notifications/Music control but will not be able to install watchfaces or upgrade to the latest PebbleOS until the app appears in the App Store. We weren't able to get as many units to our fulfillment centre as we expected (held up by documentation at the airport). Less than 500 units are going out today, with more expected to ship soon. We accidentally more Address Confirmations emails than available Pebbles. So some people who received address confirmation emails will not get a tracking number for a few days until their Pebble ships out. 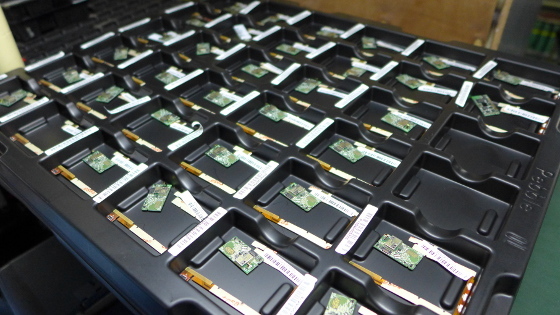 We're also working on adding shipment tracking to account.getpebble.com. Please do not email us right now about shipment tracking, we will not be able to provide any information over email about the status of your Pebble. As soon as this functionality is finished, we'll post an update and you'll be able to check online. Sorry for the delay on this. 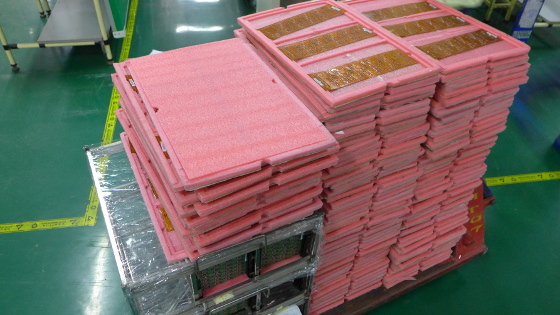 As we mentioned during the last announcement, mass production has started at the factory. 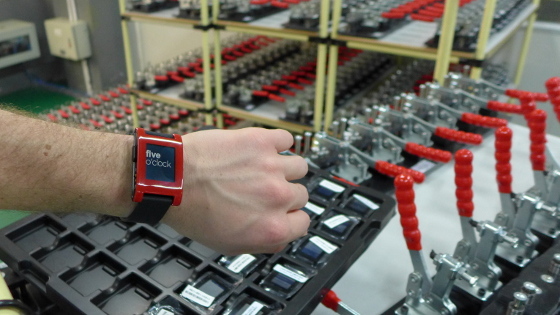 It's awesome to walk along the assembly line and see thousands of Pebble components in various states of readiness. It's going to take some time before we reach our maximum capacity, but we're getting there. We have more than 1,000 glue jigs on the production line. 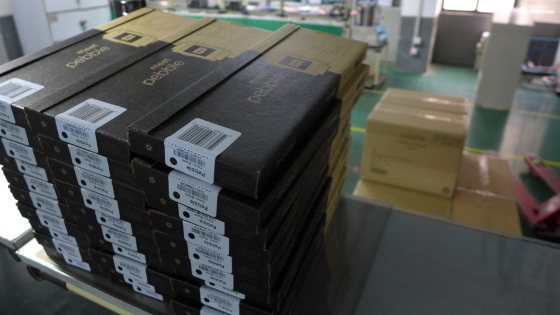 Ah a beautiful sight...finished product, all boxed up and ready to be placed in 60-Pebble master shipping cartons. We are shipping master cartons of Pebbles by air freight across the Pacific to our US distribution center 1-2 times per week, and 1-2 times per week to our Hong Kong distribution center which fulfills shipments to any country that isn't the US. There is a 5-7 day lag between a Pebble coming off the assembly line, and it arriving in a fulfillment center for shipping. During the press conference, thousands of people tweeted with the hashtag #pebbletime and posted questions on Facebook and Reddit. The winner of the Clear Pebble contest is Luke K. (from Facebook) for asking a great question: "What is the most interesting/unique idea for the use of a pebble that you have heard to date?" I didn't have a good answer at the time, so I wanted to follow up. There was a thread on our forums.getpebble.com recently about how to use Pebble to, ahem...creatively bend school rules during exams. Definitely one of the most unique Pebble use cases! Runner up's for the contest will receive t-shirts and some other swag: @flashpunk, Phoebe Furby Sturges (from Facebook), captbunzo (from Reddit). Winners, please send us a message via Kickstarter and we'll get your gear sent out! Our job is most definitely not finished, we have lots of improvements to make, and tens of thousands of Pebbles to ship out. We will continue our biweekly updates, and as was mentioned 2 weeks ago, we'll be issuing software updates with new features for Pebble every 2-3 weeks. Thanks for the support, everyone! Looking forward to hearing what you think of Pebble when it finally makes it onto your wrist. I really regret backing this project now. It's been a year since I backed and still no projection of even when my watch will be shipped. It will be out dated technology before it even reaches my wrist. A sad end to a promising project. I try to be patient, but it is very hard! Regret to have changed from black to white. start the production of the white Pebble? Where can I order another charging cord please?? Asking about shipping updates doesn't seem to get anywhere. still no shipping updates... everybody I know already got theirs... when am I going to get mine??? really hoping to get mine in time for christmas this year. Do you know when you will be shipping my unit? When? When? When? I'm living in South Koea. How long does it take to "process Shipment"? It's been sitting on that for a week now. Just ship the damn thing already!!!!! can i ask a stupid question. I paid a little more for a color watch and i am paid for shipping as i am out side the USA how come i paid more than some people and i know there are more people thinking this as did they. yet we are not getting shipped to first? it seems like the USA backers are having more sent out. As john said 1 day ago there was 1000 but today there is 2.28k and the rest of the world who paid for shipping have 420? are the pebbles being shipped out in order of backer? They are still listed as being 1000 shipped to USA and 420 to the rest of the world. So is this a shipping problem or a reporting issue? Ordered a black, back in April and received on Friday my email requesting confirmation of shipping address. I guess this means mine is on the way?! I pledged April 19th black. Any guesses when I might get mine? Seems like they are pumping out a lot now, almost 10k made. I get a feeling ill be in the 20-30k batch. @Ryan, I feel for the folks that backed a colored option, especially for those that switched from black. I hope they will fill color orders based on backer order regardless of when the color switch was made, i.e. you don't fall to the back of the line as is your concern. I have to believe that running only black in the beginning was a tough call by Eric, but one that he clearly felt was the right choice for the project. He did indicate that it didn't mean that all the black pebbles would be run first. I have no idea what the issue was, it could be that they had expected some of the dedicated color tooling to be ready sooner, or inspection of the tooling found flaws. Some have suggested that the same tooling is being used and to switch plastic colors requires cleaning, priming, etc. between colors. Regardless of the reason, I do believe it was unplanned and somewhat out of their control. Hang in the man. I'm annoyed by the color being the dictating facor... I pleged on 4/11/2012 2:01 PM and because I chose grey I won't be getting mine until after people who ordered in may? Normally I'm a relaxed and calm person but that will really make me mad if I'm one of the later people to get one based on color selection alone.. Finally it says processing shipment!!! Will we be getting a tracking number on the shipping? That is very convenient.... I use an Mac, iPad and iPhone to check the 'Is pebble shipping?' page... So Safari all over. Please consider converting it back to readable stats for Safari. I can't see the graph on www.ispebbleshipping.com on any of my browsers (safari/chrome/firefox/ie8) ...... the suspense is killing me !!! The newest version of www.ispebbleshipping.com using the gviz graph does not render on mobile devices such as the iPhone using Safari, Chrome, or Opera browsers. Oy, I backed this on April 13th, for the black. No sign of any address confirmation at all, despite the fact I've kept my information current on the website. Ironically it still says that these are scheduled to be shipped/delivered in Sept 2012. Yes, I fully understand the problems inherent in designing/building something new in such huge quantities, but these very vague updates about shipping are really, really irritating. I received my shipment notification too! I'm not an early bird, but entered my pledge on the first day. Black Pebble shipping in US. Hope others get theirs soon too! Am I the only one impatient enough to keep checking the ispebbleshipping.com site every hour? My Pebble is now shipping via Singapore Post to Germany. I've been one of the 200 Early Birds and chose a black one. @Adam Weisblat your Motorola Defy Xt you just bought runs gingerbread, 2.3. This came out in December 6 2010. I would personally demand a refund from my carrier, so still selling a phone with software over two years old. It looks like its a $99 phone. Why bother, the 4S is $99 or the iPhone 4 is $0. @Pebble tweeted to me that they are shipping twice a week, clearly this just isn't true. Monday 4:45 PM Eastern - <500 shipped. The slow shipping rate and lack of change since last week needs to be explained. Whiskey Tango Foxtrot, guys? < 500 still? Like other here, it would be nice to have some more realistic updates. I funded this thing almost a year ago, and my update status says, "we have your money, sucker!" When are you going to ship more than 500??? Can you give us some realistic idea of when all backers should expect to see their device. Your update at CES of shipping starting last week was a bit disingenuous considering that you're current production rate and the number of backers. Even though you "started" shipping some of us could still be months away from receiving a watch. A little more reality and less excitement in your updates would be appreciated. As your distribution center is in Hong Kong, will all backers based in Hong Kong get a refund on the additional fee? Seems not quite justified as the US backers didn't need to pay any additional fee, the maths doesn't quite work out. is the order status box on the right of your pebble account page new? i don't remember seeing it there before. If I am doing my math right we are talking 6-10 weeks for all kick starter orders being delivered. That's not that bad... Key is the yield at the factory needs to get to 2400 a day with strong quality fast as possible. Rest is easy. Just to put some of the shipping dates in perspective, I backed the project on April 11th for a black early bird and have not received a shipping notification so I doubt very many have been shipped to backers. I'm not complaining but I wouldn't keep checking your mailboxes just yet. At this pace the last shipment will go out in 137 weeks. Hope the Pebble works with iPhone7. Still less than 500...noooooooooooooo !!!!!!!!! Too busy to update Page? <500. Disappointing, but expected seeing how the rest of the project has gone. Technically it could be zero units shipped. Still fewer than 500 shipped as of 11:30 AM PST, Friday, Jan 25. Still 500?? What a buzzkill ! Any idea when the white Pebbles will ship! Will international orders ship out together too? What's the logic in order? The suspense is killing me. So, six more months before the next 500 go out? I'm not even sure I'll want to use the damn thing when I get it, I have such mixed feelings about my involvement in this.